As so many makers do, we in MAKESHOP often turn to the internet for advice. YouTube has played a significant role in the growing maker movement. 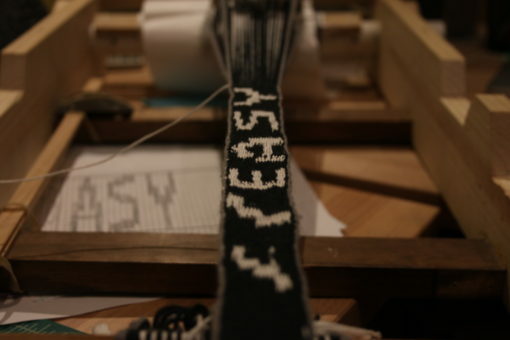 There, you can find everything from fascinating rope-braiding machines to Arduino tutorials. However, as I recently found, all the YouTube in the world can’t fully replicate the experience of sharing knowledge in person. Our guest makers from the Society for Creative Anachronism (SCA) this past Sunday really helped close the gap between the internet and the ancient craft of weaving. Making is a sensory experience, and YouTube—for now, at least—can’t engage your sense of touch. Touch is indispensable when you’re weaving. Even when weaving on a Jacquard loom you have to have a sense of the weaving’s resulting texture. Weaving can also be very mathematical. We often tell visitors that our floor loom is effectively a simple analog computer. Dressing it is like writing a program, and weaving on it executes that program. With attention to detail you can write a program that achieves intricate designs as you treadle your way through each pattern. 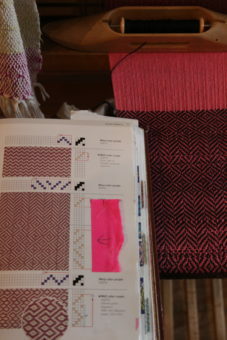 Our current weaving project with pattern book. Ada Lovelace drew inspiration from Jacquard weaving’s mathematical intricacy when she wrote the first computer program. For me, however, the mathematical aspect of weaving has always been a bit daunting. This was particularly true when it came to tablet weaving. I reached a certain skill level (covered in my last blog post) and then stalled out. 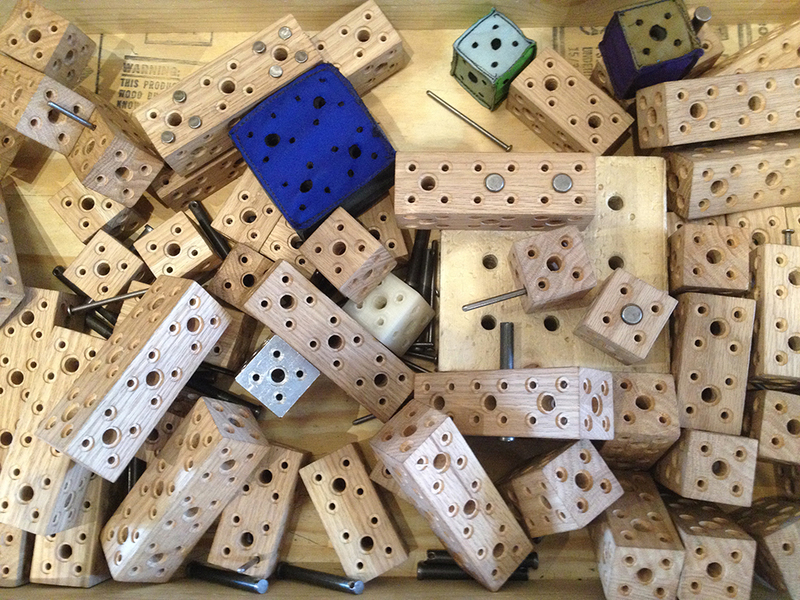 Without hands-on instruction, it was difficult to bridge the gap between theory and practice. YouTube was very helpful in my initial forays into tablet weaving. I did extensive research into it beginning with this video (sent to me by former MAKESHOP teaching artist Henry) and extending to videos on how to weave letters. Weaving with cards, much like weaving on a floor loom, involves graphing out your pattern and sticking carefully to the program. It was letters that most threw me—after a few attempts and many re-watchings of the above and other videos, I set my loom aside and turned to other forms of weaving. Happily, this led me to another building project. I discovered weavers who built their own looms in order to make fanciful fringes. Further digging led me to the centuries-old box tape loom favored by the Pennsylvania Dutch. I decided to build my own, and will be rolling it out for visitors very soon. 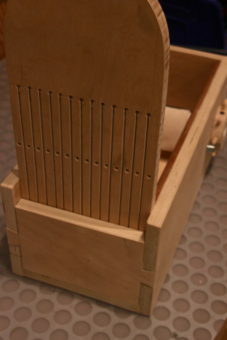 Weaving on a box loom is as simple as raising and lowering strings, and if it works as intended this will allow visitors to cut off a strip of their own weaving to take home. The tape produced can be used as straps, bracelets, bookmarks and more. Which brings me back to our friends from the SCA Fiber Guild and their Sunday visit. The SCA specializes in all things medieval and brought a wealth of fiber experience to the museum’s visitors. Among other things, our friends bought in a warp-weighted loom, a sprang loom and—lo and behold—several simple looms for use with tablet weaving! We always enjoy having guest makers, and I relished the chance to work with our friends on my neglected strap. I dragged my table loom up from the basement and sat down with the women of the Fiber Guild for a tête-à-tête. We shared what we knew and passed the loom back and forth, discussing our projects with visitors as they tried out the different medieval techniques and wove their own projects on cardboard looms. And, a few simple diagrams and some conversation later, I was doing it at last—weaving letters! “Easy” might be overstating it a bit. We have been weaving in MAKESHOP for about the past week. The ways in which we can weave and teach continue to expand—coordinator Devon recently introduced us to a form of braided ropemaking, and teaching artist Kyle built a tapestry loom currently holding its third weaving project. With a little help from our friends, we’ll soon have two more ways to bring the wide world of weaving to our visitors and even weave a message if we so choose. The letters look marvelous!! Great proportions!